I still haven't managed any fishing and I'm hobbling round like the old crock that I am so here's a nice little piece from another epal Pete Evans to keep the pot boiling. I’ve been an ardent follower of your diaries for more years than I care to remember, been fishing the Purbecks on occasion for the last 20 years with mixed success. 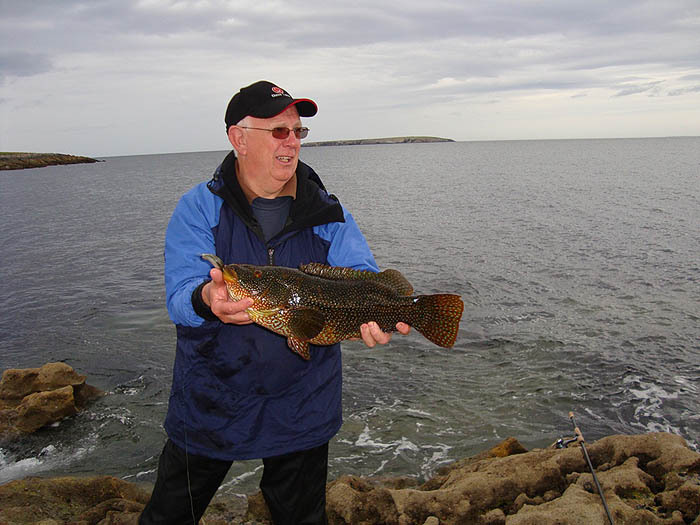 Your recent diary entry regarding wrasse on soft baits reminded me of a trip to the west coast of Ireland last year with a group of friends and I thought I would share this with you. I hope you don’t mind. We were fishing a rocky outcrop at Scraggane, Castlegregory, incoming spring tide and being new to the area did not know what to expect. Having geared up with surface lures, floatfished sandeel and slug-gos, basically we all did our own thing. At the time the sea was calm, ideal conditions, clear. The floats produced pollack to 5lb and we had lots of medium sized wrasse to surface lures, no bass were showing, but I was sure they were there. One pal, who was new to lure fishing was becoming disconcerted with the lack of action. Having been convinced to use a Slug-Go, he thrashed the water, trying to cast as far as he could, with not a sniff. He dropped his slug-go into a gully to the side of him to check the “action” of his lure. No sooner had he started “wiggling” this along the gully, a hit appeared from below a ledge and an unexpected struggle ensued. When landed this fish was a tad under 5lb, and was a great lesson to my rookie friend, “never be afraid to fish at your feet”. I’ve attached a photo of mate and fish. At the end of that tide we hopped back over the rocks, the tide there was about 5-6 metres so our return journey was via a much higher and precarious route. I had noted at low water a thick bank of rotting weed in a little bay but paid little attention to this at the time, being preoccupied with the thought of bass. 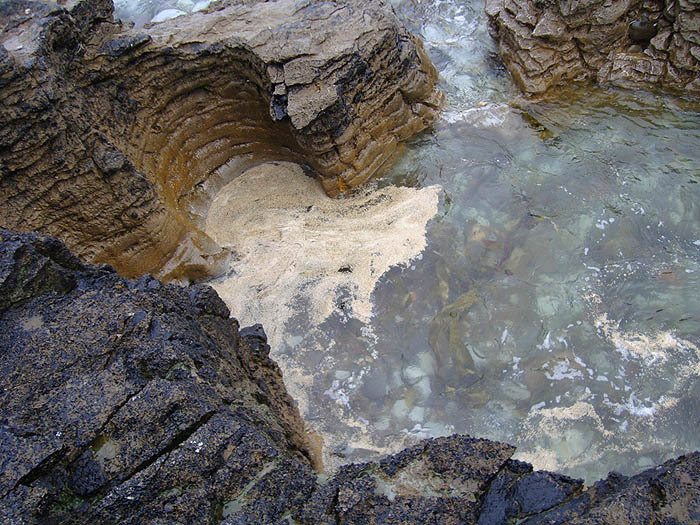 At high water I found clouds of white maggots washing against the rocks, it seemed so alien and there were no obvious signs of mullet feeding on them, unlike at home in Dorset. As an aside, we revisited the place a couple of days later, expecting a repeat performance but were disappointed to find someone had put a net down among the rocks. 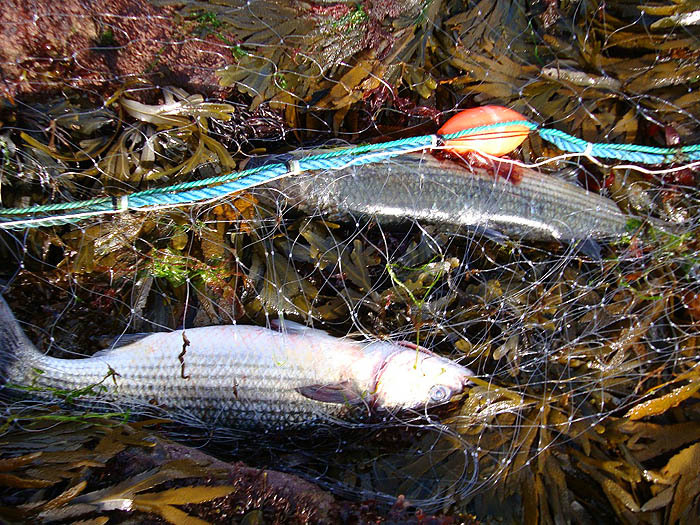 Decent bass and mullet were caught in the net along with large wrasse. 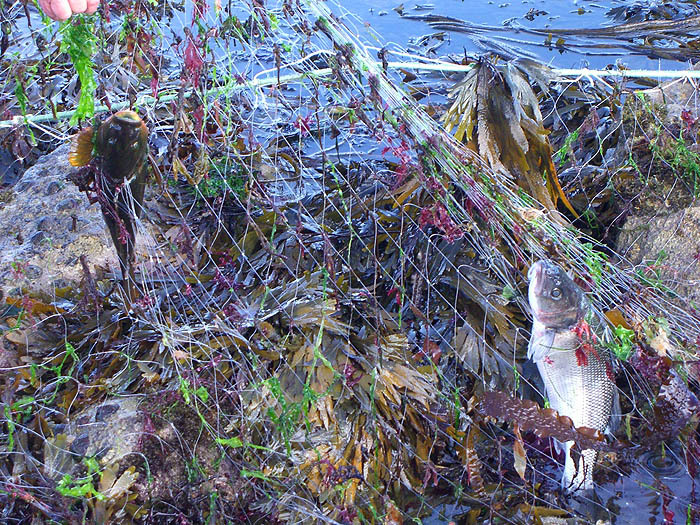 I believe netting from the shore is illegal in Ireland but policing this is impossible in such a remote region. I’ve attached a couple of photos I took. Apologies for going on, I hope this information has been of interest to you.